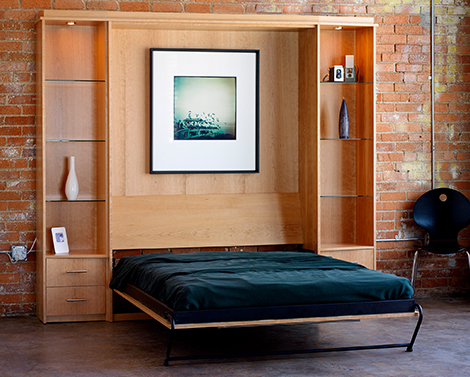 Beyond Storage | Murphy Beds in St. Louis, MO. Roll away cots or blow-up mattresses can clutter your space and are an uncomfortable sleeping solution for hosting friends or family at your home, which many home owners don’t think about. By investing in a Murphy bed in St. Louis, you combat your space constraints while still providing a multi-functional and comfortable unit in your home. These types of beds are also a great statement piece for your home’s décor. Take a look at our gallery of spaces throughout St. Louis that we have been able to transform by adding hideaway beds, closet systems, and other storage solutions. These beds provide a variety of benefits for homeowners looking to maximize their space. Beyond Storage customers can select from a variety wood types and finishes for each bed unit to match seamlessly with the interior design of their homes. A Murphy bed also allows you to regain the floor space in your guest room, home office, craft area or den while still having a bedroom for visitors to use. To see examples of the beds we have created for customers in St. Louis, view our Murphy Beds Gallery. Murphy beds from Beyond Storage are custom produced, so there are countless possibilities for building the perfect wall bed unit that has the functionality and style you are looking for. Whether you would like custom built shelves, desks, cabinets or night stands added to your Murphy bed unit, we will ensure that it matches your expectations. 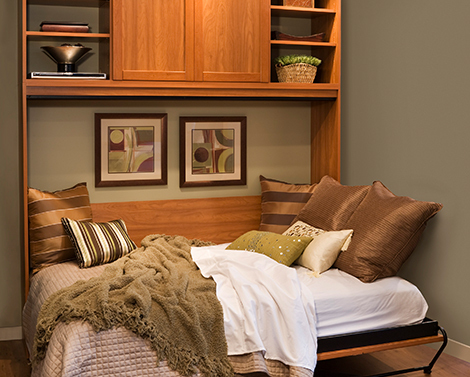 Interested in getting a Murphy bed for your home? Contact us below and learn how you can get a free design consultation.